Incorporates everything you need to repair and re-polish kerbed, scratched and corroded rims and lips on alloy wheels, or to make ready for repainting. Existing wheel repair methods requires investment in several items of expensive equipment. It can handle all designs of car and motorcycle wheels, up to a maximum diameter of 23 inches (with or without central hole) through its automatic pneumatic clamping system, making it incredibly versatile. 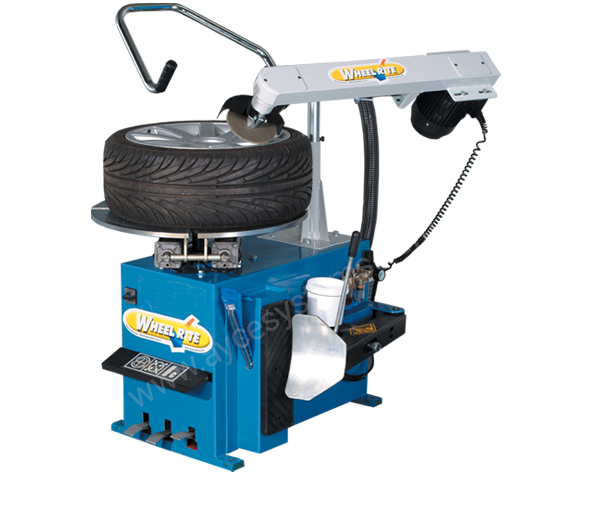 The unit is electrically operated and allows the wheel and tyre to remain in situ whilst a rotatable floating arm presents the grinding and polishing wheel to the rim. An explosion-proof dust extraction unit can be fitted as extra. The unit comes complete with a starter kit of grinding and polishing wheels. A complete range of consumables are also available, including a full range of alloy paints, fillers and clearcoats. For more information about our Wheelrite Pro system click the button below to download the print friendly PDF brochure, or if you would like to receive a quote for this system, please click the request a quote button.